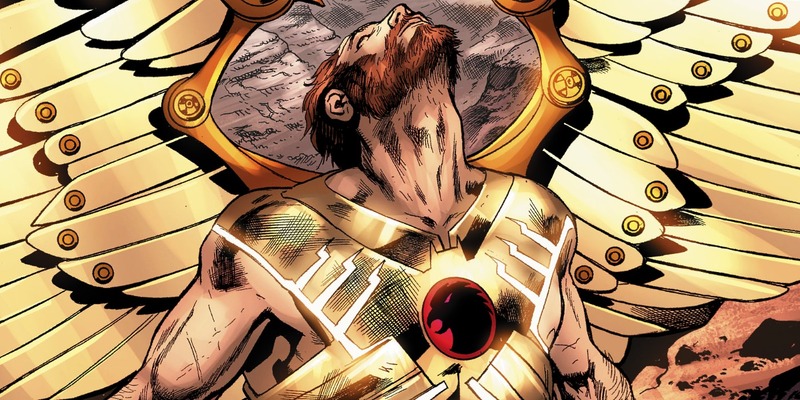 Hawkman's role in DC's METAL comic is hard to explain, but the return of Carter Hall feels like the start of a bigger Rebirth. Curious fans in search of answers may be disappointed to find that Hawkman: Found is hard to follow, but in a way, it's fitting. Even before the massive METAL event began, the DC hero was famous for being one of the most problematic in all of DC's mythology. One hero, two origin stories, and an uncertain future after more than one failed reboot. So when the first pages of METAL cracked open the mystery of the DC Universe's origins, and the evil pull of its Dark Multiverse, it made sense that Hawkman was the one searching for the answer to make it all makes sense. Thanks to Jeff Lemire and artists Bryan Hitch and Kevin Nowlan, Hawkman: Found reveals just what answers Carter Hall found. The bad news: the darkness only Hawkman could feel growing claimed him, as well. The good news? Batman and Superman have arrived to help restore Hawkman to the hero he once was. But before they succeed or fail, Hawkman: Found gives new comic readers a taste of why a proper Hawkman Rebirth is long overdue. Curious readers can do their own digging into the complicated history of Hawkman, and DC's many attempts to rewrite or simplify his conflicting mythology. Long story short: the first Hawkman was Carter Hall, an archaeologist who soon learned he was the permanently-reincarnating spirit of an Egyptian prince (destined to seek out a lover and battle an enemy locked in the same cycle of death and rebirth). It's this version of Carter who actually opened the story of the METAL event, told through his personal journals. From the moment an alien ship crashed into ancient Egypt and transformed him into the immortal Hawkman, he's been after the reason why. It's that question, Batman and the readers assumed, that led him into the darkness now swallowing DC's Multiverse. But with Hawkman: Found, we finally see what Hawkman found when he stepped through the veil. Again, fair warning: the story here is anchored in a character whose own past is up for debate, and fans are encouraged to embrace that mystery. As it turns out, Carter is locked inside a new kind of cycle - one of death, a perversion of the cycle fans know. Waking from a strange dream in a harsh world, and under attack from an army of 'Manhawks' in hawk-like spaceships, Carter finds a warrior's spirit stirring inside of him. Surrounded by other men who can't stop the assault - and who bear strong similarities to other incarnations of Hawkman throughout history - he climbs onto one of the alien craft. The reader knows the armor and weapons he finds belong to Hawkman, and can see Hawkman's second, alien origin being infused... but Carter can't. All he knows is that the weapons, like the armor, and the sense of purpose he finds in war, feels key to the identity he has lost. So with that in mind, fans can read as much as they like into the other alien Hawkman who attacks him. And with that, the true story becomes clear to both Carter and the reader (the best he can understand it, anyway). Carter followed the clues to the corrupted World Forge at the heart of the Dark Multiverse. He tried to right the growing darkness by manning the Forge as intended - creating new worlds, but destroying those too evil to survive - but soon fell to the villain of METAL. Rather, this nightmare version of Hawkman that seems to have been sent to imprison him in this waking nightmare. Remembering who he is, and what now rests on his shoulders, Carter defeats his foe, dons his armor and wings, and becomes Hawkman once again. Only to fly up, falter, and crash down to Earth - waking from the dream, and living it all over again. The final pages show Hawkman: Found, but Carter's struggle is a prison only for his mind. He remains at the Forge of Worlds, poisoned by darkness, transformed into the monstrous Hawk-creature Batman and Superman meet in METAL #4. The issue stops short of claiming that the space-based version of Hawkman is the same kind of nightmare as the Electric Superman. But combine his revelations here with the throwback origins Scott Snyder used to build METAL from the start, and the identity of Hawkman seems simpler. Now, he's a figure of cosmic importance. And with talent like Lemire and Hitch chosen to tell this story, fans have reason to assume DC's plans for Hawkman go beyond METAL. Plans or not, if this gives fans a hunger for Hawkman: Rebirth, it's best to let DC know. Hawkman: Found is available now.